Time for a clam bake! Now I just need to decide if these will be barbecued, steamed, or consumed raw with vinegar and shallots. I can’t wait! I should be moving to East Hampton, soon! Life is good…we just had a great family trip to a beach not far from you! I do love East End hard shells. The blue claws should be up in the back bays now as well. One word of caution, they often close clamming whenever there is a big rain. We are closed until Monday, Aug 4th on Shelter Island. 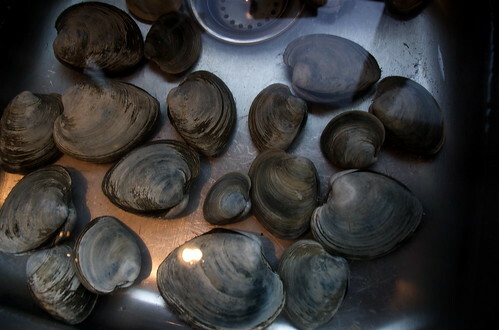 I wouldn’t worry about cooked clams, but don’t eat raw clams after a big storm. you make them sound so good!